More of a refresh than expected, but still hands down the best modern way to conquer unknown space. What is it? A turn-based 4X strategy game with some of the snarkiest aliens around and a big enough toybox of ships and technology to leave you in control. Multiplayer: Yep, with six-plus players. There’s often a fine line between revolution and evolution, and which side is ‘right’ varies dramatically from game to game. Sometimes we want the next best thing. Sometimes we want a thing we like, simply done better. That’s what GalCiv 3 offers—not so much picking up where the last game off as returning to its template with a stern expression, some better technology, and a few years of lessons well learned. 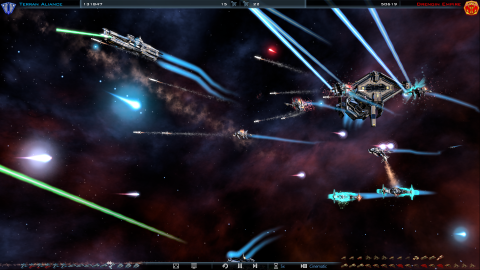 Stardock’s series is pretty much unique in the 4X genre—a space conquest game that sits alongside Master of Orion instead of simply in its shadow. It’s not just a game of rules and strategy, but of quirky charm—witty descriptions to take the harsh edge off the technologies, an attempt to make the aliens you encounter feel like they have personalities instead of simply being a rendered face on some stats, and enough wrapping to feel like there are could actually be people/aliens somewhere behind your comma-filled population figures. The biggest two differences between this version and the last, aside from a graphical polish, is that GalCiv 3 now supports multiplayer and demands 64-bit. The former speaks for itself. After years when the characters themselves would occasionally mock the idea, you can now have multiple players fighting over a galaxy. The 64-bit side of things is more interesting, though for the future rather than now. Much like a Civilization game, GalCiv is intended to have a long life. For the moment, it allows for crazy things like having a map with a hundred empires on it (though good luck actually doing that, never mind playing the result). It does however mean that future expansions, and player mods, have far more room to breathe than they once did, which bodes well. From another company, it would be hard to take that on the nod. Stardock though has proven form in this regard, both in improving its good games, and fixing up the originally dreadful Elemental. Either way though, the core game is extremely well-made. It’s not simply a question of rules and options but the general feel that made the series what it is, the biggest being that (with a combination of tech and wrapping, much like Alpha Centauri) playing against the AI has the feel of being up against opponents rather than simply algorithms that happen to have a face on top. Where so many 4X games, particularly space ones, are almost willfully cold, there’s a warmth to GalCiv that’s key to the fun of casual to at least mid-tier play. Like past games, it does have a few irritations that only really strike mid-way through, such as finding out what’s actually wrong with a planet that looks like it should be performing far better, and otherwise tracking down some numbers in a pinch. By the time you’ve gone from a few systems to a bursting empire, there’s enough of them splashing around to drown in. Individual sections are very well laid out, with the Tech Tree especially making it easy to see what leads to what and what the benefits are, but the lack of a good centralised in-game Civpedia type resource does make looking things up harder than it should be. The biggest omission from the last game—for now—is that political side has been stripped down. No elections, no governments, no spying. They’re due to return in a later expansion. The sting of that is helped by a few new arrivals though, such as ideologies. Where past games had a Good/Evil system, the civilisations this time are judged as Malevolent, Pragmatic, and Beneficial, with moral decisions providing points in each that can be cashed in for special perks. These range from basics, like a free colony ship or a top-quality planet, to galaxy-affecting boosts like any race who attacks your homeworld being automatically declared war on by everyone but their outright allies, and every planet or starbase within your Influence range joining your empire. Nobody ever said you can’t be both Benevolent and bastardly sneaky at the same time! Other new additions include pirate bases that become more of a problem the longer they’re left alone, a shift to space based ship construction, and new environmental dangers to deal with while exploring the map. GalCiv 3 is easily the best recent 4X of this scale. GalCiv is far more focused on the strategy side of conquest than the tactics of individual ship encounters. You don’t get any direct control over your ships at all, though you can watch the very pretty laser-beams and explosions from assorted cinematic angles if you choose. Instead, ships are given classes based on their load-out. A basic hull might be a Guardian, but slap life-support on it and it becomes a Support. Its role determines what it does and who it goes after in combat. How it actually looks though is almost entirely up to you. The design panel includes a huge selection of aesthetic items that can be scaled, moved, stuck onto hardpoints and even given some basic animation, all ‘free’. Ships can also be shared, with Steam Workshop support coming. Whether new to the series or returning though, GalCiv 3 is easily the best recent 4X of this scale— the whole galaxy as campaign and sandbox. It’s hardly the most dramatic upgrade a game has ever had, but it’s both a more than solid update in the here and now and a great base for expansions and mods for the next few years. Infinite space, still never enough good worlds to go round. Much like Alpha Centauri, enemies have personality and enjoyable predictability. Big events are treated as such—lush CG, prettiness, drama. Defend my new planet… with a giant shark? All of the yes! Aesthetics and function—the ship designer handles it all. Only Class 11? I feel bad, but I don’t know why. Great. Look who just moved in next door.